A well-performing range of inverters from 275VA to 2400VA for small to medium sized systems, with an optional built-in PWM solar charge controller. The devices in this series offer low self-consumption, a battery protection algorithm, and compact construction. The inverters of the AJ series have been present in the market for many years and have widely demonstrated their superior reliability. Being delivered with AC and DC cables, they are truly "plug and forget" devices. In addition to a high surge power capacity, the AJ have a very low self-consumption thanks to a precise and efficient stand-by function. The load detection in stand-by is automatic and adjustable from very small loads. The inverters offer a battery protection function that intelligently manages the low voltage disconnect level as a function of how the battery is being used. The so-called B.L.O (Battery Lifetime Optimizer) protects the battery from repeated deep discharges, thus significantly prolonging the useful life of the battery. 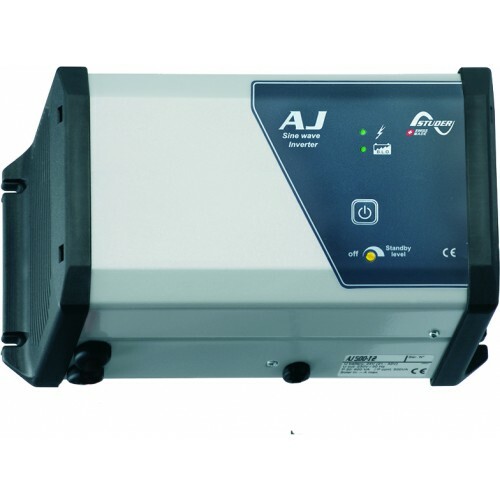 The AJs in 12 and 24Vdc are certified in accordance with the ECE-R 10 standard. This certification is mandatory in the European Union for all electrical equipment on board transport vehicles.